A Phurba is a triple sided Ritual Dagger from Tibet patterned off an earlier Verdic Tool. The Verdic tool was a tether used to stake sacrificial animals. The Tibetan meaning for Phurba is as a tent stake. The three sides of the dagger represent the spirit world, and the ‘stake’ brings all three worlds together. The symbolism of the Buddhist dagger is the destruction of foes or obstructions. The lower part of the blade represents “ Method”. The Handle represents “ Wisdom”. This ritual dagger is not meant to be used on sentient living beings. 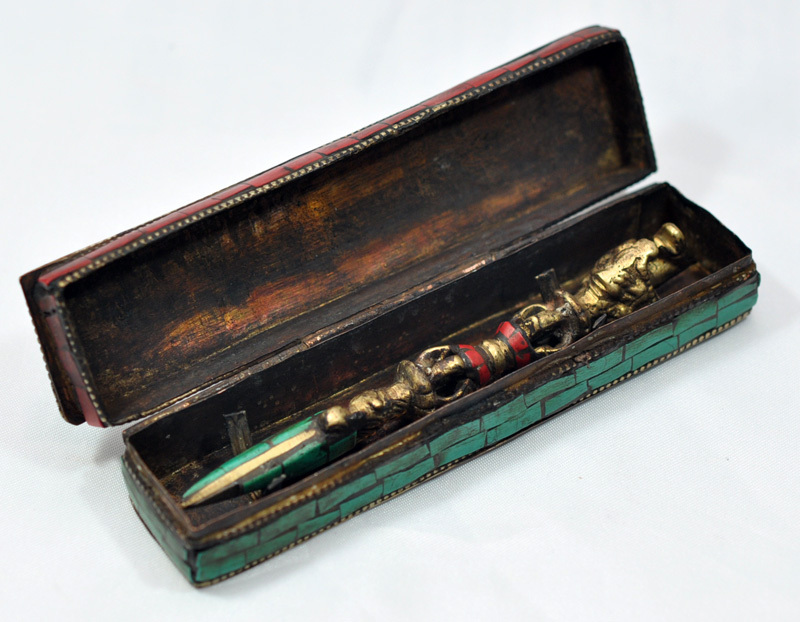 The wielder of this dagger would use the tantric energies against evil spirits. This is used to subdue evil spirits and negative energies. The dagger is said to be able to transform these energies into positive energies. The three segments of the blade represent the power of the dagger in this transformation. The three energies to be transformed are known as the three poisons - Attachment, Ignorance, and Aversion. This dagger is also used to confront Eastern spirits ( & western Ghosts). The belief is that spirits are confused and linger lost between the realms. By plunging the dagger into the spirit, the confusion is removed and the spirit is able to move on and be reborn. One can also use the dagger to ‘pin’ down restless energy in an area. By taking a series of daggers thrust into the ground and connecting them with certain color strings, one can make a stable or protected space.